Our range of stunning sliding wooden patio doors have been designed to be tailored to the size of the opening and the way that the room will be used with many options available. Our sliding wooden patio doors are built with security, high performance and long life in mind. Every wooden sliding patio door and our design system allows for very large and heavy doors (up to 400kg) to be specified without compromising the sliding performance of the patio door. Key features of our wooden sliding patio doors include low resistance sliders, multipoint locking, night vents and internal beading to ensure extremely high performance. Choose from a range of glazing, timber and paint options to achieve the exact specification that you require, all offering our Warmlite 10 year industry leading guarantee. Locking System The multipoint locking system provides locking points around the door operated by the handle. In addition to excellent security performance, these fixing points prevent the timber from moving, contributing to the long life of the door. Low Threshold Cill The cill design provides a low threshold as standard with little drop front to back. This allows the door to be installed below the floor level to give a smooth transition from floor to cill. A timber cill is also available, but has reduced weather performance and is only advised in very sheltered areas. Night Vent Ventilation can be provided by turning the handle to the upright position which drops the seals on the top of the door providing ventilation whilst retaining security. This method removes the requirement to lift the door when opening it, a method commonly used in many other systems (lift and slide doors). Low Resistance Sliders The track and rollers are supplied by one of Europe’s leading door systems companies providing a premium product with innovative features. Large Doors Ventilation can be provided by turning the handle to the upright position which drops the seals on the top of the door providing ventilation whilst retaining security. This method removes the requirement to lift the door when opening it, a method commonly used in many other systems (lift and slide doors). All Warmlite timber patio front door installations are covered by our 10 year guarantee. This gives you the peace of mind that in the unlikely event something should go wrong with your wooden patio doors, you can get them fixed quickly and conveniently at no cost to you. The guarantee covers material defects in profile materials, panels and glass units. 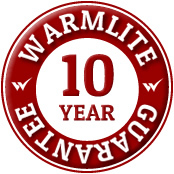 In the very rare event that a problem develops with your timber patio door during the ten year period, Warmlite will simply replace the affected product. Warmlite use certified Redwood Woodheart® as standard for our sliding wooden patio doors. We also have a range of hardwoods and Accoya modified timber to choose from. As standard all our wooden front doors are manufactured from Redwood WoodHeart®, the heartwood taken from Nordic Scots pine trees (see diagram). By utilising this heartwood, we get very good durability and dimensional stability, as well as very good thermal performance. The coating system is vitally important for the longevity of timber doors. It essentially serves three purposes; to prevent UV and visible light damage to the timber surface, to slow down the rate at which moisture is absorbed and released from the timber and to provide an attractive colouring and surface finish to the product. We can provide dual colour windows and wooden patio doors with a different colour inside to out or frame to sash. This also allows for the frame and sash to have a different dual colour specification if required. For further information about our versatile timber / wooden patio doors, a free site survey with a no obligation quotation or to arrange an appointment. For further information, a free site survey, a no obligation quotation or to arrange an appointment with one of our specialist consultants at a time/date to suit you, please fill in the details on the left.